Jean-Claude Van Damme’s split for Volvo has gone viral and rightly so – it’s amazing. 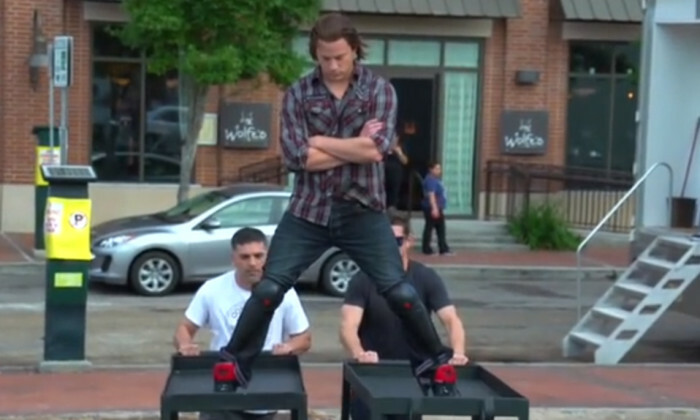 Seeing the success, fellow actor Channing Tatum decided to try out a similar split in a spoof ad. Tatum taking on his character for upcoming movie 22 Jump Street, Jenko, attempted the split. But unlike Van Damme, his splits occurred on two food carts while two guys manually spread the carts farther apart. “I’ve had my ups and downs,” Tatum said in character as officer Jenko. “Being an undercover cop. That’s what made me what I am today. Surviving high school is no easy task, but because of this, my body is now engineered to defy the law of physics and a mindset to master the most epic of splits,” he said. 22 Jump Street is scheduled to hit theaters on June 2014. Are Malaysian marketers brave enough in this digital age? Malaysians might be addicted to online content, but are they willing to pay? Malaysians topped the list with 68.6% of respondents saying they are unable to stop using their mobile phones. ..